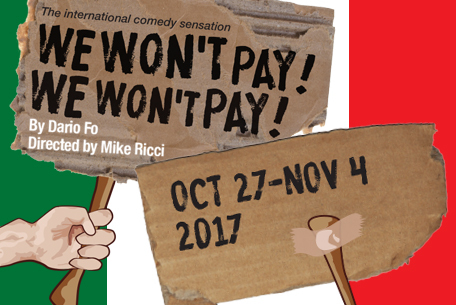 theitalianculturalcenter - We Won't Pay! We Won't Pay! Written by Nobel Prize winning playwright Dario Fo, this laugh out-loud farce has been described as 'The Honeymooners meets I Love Lucy'. When the women of one town refuse to pay higher prices for their groceries, they start a protest, which starts a series of hilarious twists and turns for Antonia and her friend Margherita, who stay one step ahead of their husbands. Dario Fo has something to say about the government, labor practices, the health care system, religion, the police authorities, and economic disparity. There will be a food drive accompanying each performance. Ticket-holders are requested to bring in a non-perishable food item. Friday, October 27, 2017 at 7:30 p.m.
Saturday, October 28, 2017 two performances at 2 p.m. and 7:30 p.m.
Wednesday, November 1, 2017 at 2:00 p.m.